The world of aquaponics has grown substantially over the last decade. 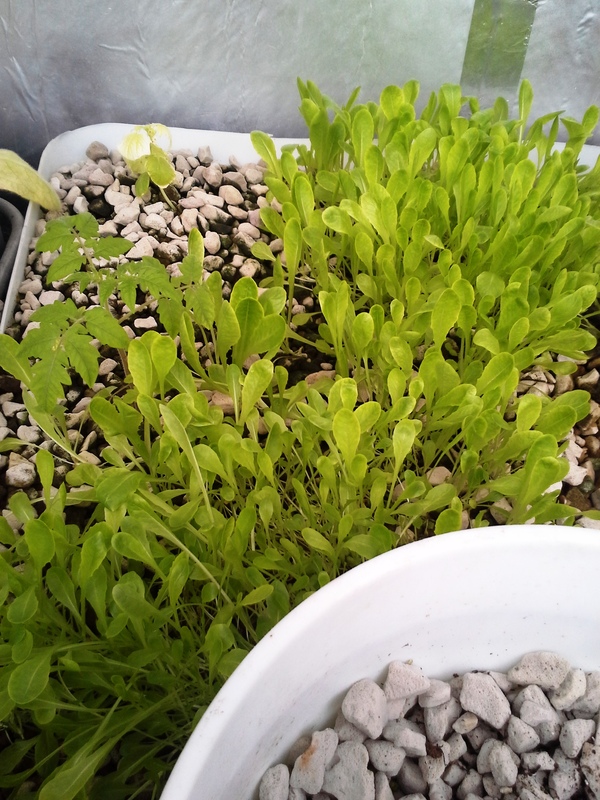 Many have started to realize the ease, convenience, and benefits of growing vegetables in an aquaponics system versus traditional gardening. 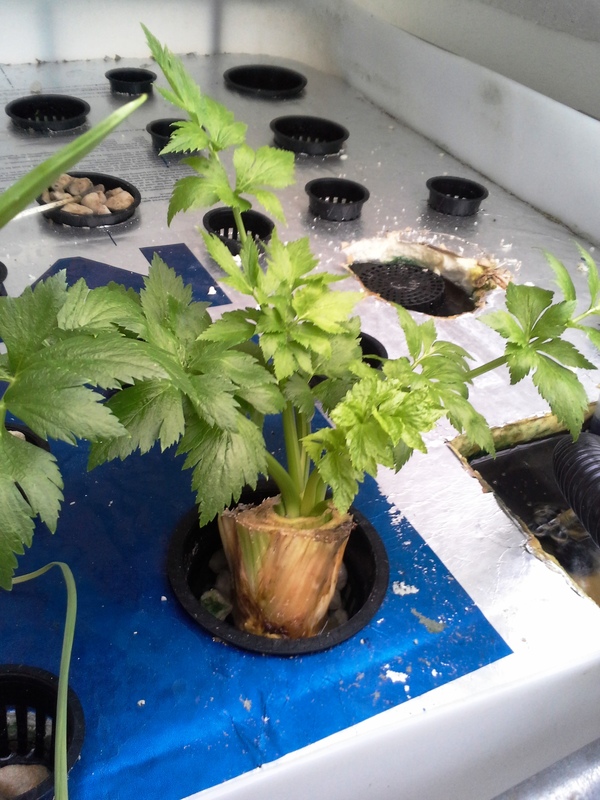 Also utilizing aquaponics indoors extends the grow season to a full 12 months. Not to mention that many small indoor systems can be very attractive to the home decor. But once you have determined that it is right for you, there are many decisions that should be made before spending that first dollar to set up your system. Before even thinking about the type of system to install, first think of the goal’s you would like to meet with your system. 1) Are you trying to extend your grow season in a colder climate? 2) Are you planning an indoor or outdoor system? I do know people in our area that are building outdoor systems, but I have not tried it in our climate so I really cannot speak about it’s pro’s or con’s. Maybe after next winter they will be able to give me some insight. 3) What type of plants are you wanting to grow-flowers, vegetables, herbs, medicinal’s? This will help determine the type of system that would work best for you: Fill & Drain or Constant Height. Flowers and most vegetables will do better in a fill & drain system. Herbs and some medicinals seem to do better in a constant height. We grow our tomatoes and peppers in the F&D, but celery and cabbage lend better to the constant height. Leafy greens, like spinach, arugula, lettuce, & mescaline have done well in both. 4) Are you wanting to also harvest the fish from your system? This is probably one of the biggest reasons we are in aquaponics. I wanted fresh fish, but I hate to go fishing! Using a net to scoop out my dinner from a confined tank seems like no sport, but I am in this for dinner, not for sport. One of the major drawbacks to using tilapia is the need for a constant water temperature above 68 degrees. This means the addition of a tank heater in most cases. One of my customers went into his greenhouse this winter and found frozen fish-sicles. The electric, thus his heat, had been off for about 3 days during the coldest part of February this year. Other great fish to use in aquaponics, if you choose to harvest for dinner: catfish, perch, and trout. These fish are more cold tolerant and usually do not require heat. I will warn you not to go catch fish in the local lake and transplant them into your tank, Start your fish family from a good breeder to insure you will be getting good, healthy fish. If you do not want to harvest the fish for the table, Koi is very popular. These may be popular for sushi, but they are also very popular for backyard ponds because of their winter hardiness. One of my friends has a very thriving Koi business and is adding aquaponics to his outside grow tanks. 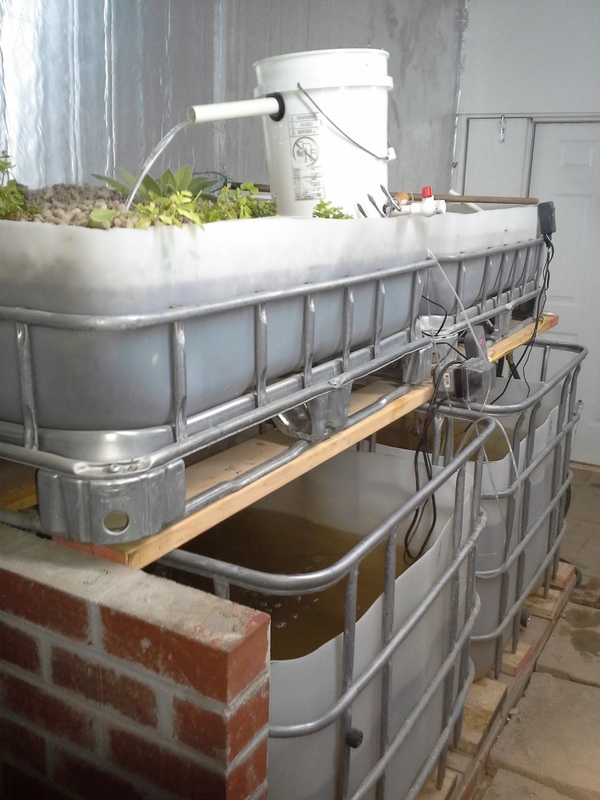 Not that he is expanding his venture into commercial food production, but aquaponics makes a great filtration system for his tanks, without having to add any chemicals. 5) How much space do you have for a system? The system that we build from IBC totes takes up approximately a 4′ X 4′ space and is about 4.5′ tall. The grow bed is 16 square feet of grow space, approximately 12″ deep in grow media. (Think square foot gardening) The fish tank will hold approximately 150-160 gallons of water, which will easily accommodate the square footage of the bed. You can actually add a second bed to one tank without issue, but trying to go any larger will cause issues. Rule of thumb is approximately 7.5 gallons of water per cubic foot of grow bed (16 X 7.5 = 120 gallon), but you can go to as low as about 5 gallons per cubic foot. Two grow beds would be approximately 32 sq ft X 5 Gal = 160 gallon of fish tank. I would never go below 5 gallon per cubic foot, as the fill and drain system would almost completely drain your fish tank with each cycle. 6) When you consider the type of fish, educate yourself on the needs of that species. Like stated earlier. tilapia need a constant temperature around 68 degrees and never below 60. They are also happy with less oxygenated water than many of varieties. With a fill and drain system, there is normally enough oxygen generated just by the water drainage back into the fish tank. Other varieties of fish may need additional oxygenation in the tank. Tilapia also need space. Traditionally, you never want more that one fish per 5 gallons of water. So a 150 gallon tank should be able to handle 30 adult fish. In my experience this is heavy for just one grow bed. Tilapia, a cichlid, are poop making machines. 10-15 adult fish will easily handle the waste needs for one (4×4) grow bed. If adding a second grow bed, 20-25 fish is adaquate. Other fish varieties may be different, so again, educate yourself on the type of fish that you would like to grow. The above factors and goals should all be considered and determined before making any outlay of money for your system. Even if you are a do it your-selfer, answer these questions at a minimum before moving forward. Take the time to educate yourself on aquaponics growing and your fish of choice. Once you start to install your system, you will be glad you did. If you are in the area, check out our aquaponics basics classes and DIY tank building.